“Trump is hated by everyone,” comes one unnamed former official in an account to Vanity Fair, one supposedly sourced after the President’s State of the Union Address. Another claimed that all was wretched in the White House: “It’s total misery. People feel trapped.” Off record stuff, unnamed and, as ever, doing nothing to concern a leader whose interests have always lain elsewhere. 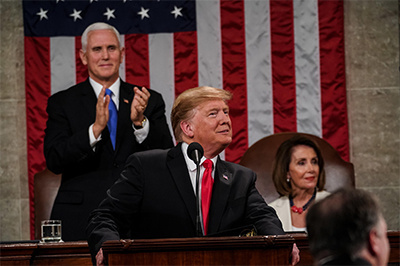 Whatever the chronic dysfunction affecting the West Wing, what mattered for Donald Trump was simply getting his State of the Union address going. And long it was too – 82 minutes, making it the third longest in history. The address saw Trump return to what he is most comfortable with: campaign mode. Governance is less important than combat. When there are troubles, and when there is crisis, he searches for the rally, the reassurances of his formidable and, it would seem, unshakeable base still ignored on either side of the coast. The speech was seen by Susan Glasser of The New Yorker as “sort of gauzy” with hints of “World War II triumphalism”. The language was, in the main, thin puffery, that of the exceptional nation which had “saved freedom, transformed science” and done more than its bit to redefine “the middle class standard of living for the entire world to see.” In a sense, this is true: the paradox of US living is that it supposedly reconciles middle class living with horrendous swathes of indigence and an active food stamp culture, a true glory to the distortions of Social Darwinism. US presidential addresses tend to sound like bits of elevated shouting, the imperial figure, clutching the purple, looking down at his global subjects to lecture them about an extensive curriculum vitae thick with achievement. “This is our future, our fate, and our choice to make. I am asking you to choose greatness.” This is the great mythology of choice, one that takes root in the experimental soils of New World optimism. It hides, or at least ignores the obvious point that greatness has often nothing to do with choice, being, as it were, a convergence of accidents, unintended steps and old fashioned stumbling. US society was not conceived as a committee’s work in progress. The Democrats remained defensive and unmoved, preferring a softer approach to dealing with illegal immigration. Nor are they are likely to ease up on the investigations, which they have become inexorably linked to. It said much about the neurotic state of affairs that is Washington politics: Trump can speak to unity where it doesn’t exist, a common ground that is simply not being reached. Nor can it. Unity is precisely what the president is not, the toxic, necessary revelation of a society rented through with divisions that have turned into votes. For the US to again fall into the fictional language of forced consensus, one manufactured in the hot houses of technocracy and the board room, would be for Trump to disappear, for his America to vanish into the illusion of agreement. That is hardly going to happen – at least for now. The economic figures have given him leg room; his supporters have not left. Nor do the Democrats have an answer. The conspiracy of happiness has yet to return. Dr. Binoy Kampmark was a Commonwealth Scholar at Selwyn College, Cambridge. He lectures at RMIT University, Melbourne.